A beautiful letter from Louise, a 200hr Intensive Teacher Training graduate, who has taken the skills learnt on the teacher training course and is using them to make a significant change in peoples lives. Being awarded a CAMYOGA bursary has been life-changing for me and enabled me to bring the gentle healing power of yoga to a group who really need and appreciate it. Let me explain…. Although I’ve had CFS/ME and Fibromyalgia for 17 years I was doing OK and had a great job working for the Environment Agency (a brilliant employer for anyone with a disability). Then I got breast cancer. Twice. The treatment, including five operations within three years, saved my life but was too much for my body and led to a severe CFS/ME relapse meaning I had to give up work. It was during that difficult time that I truly began to really appreciate the more subtle practices and that yoga really is for ‘every body’. As Krishnamacharya said, “if you can breathe you can do yoga”. I’d wanted to take yoga teacher-training for a couple of years, not with the intention of teaching, but rather because my self-directed learning had left me with more questions than answers! This dream now seemed impossible - I was unable to work, money was tight, and my personal practice had diminished considerably due to my health problems. Head well stuck into the ‘self-pity potty’ I was having a big old moan to my husband when he just looked at me and said, “but Louise, you could teach people like you”. Wow. Talk about ‘light-bulb’ moment. Of course I could! I could share all the yoga techniques that had helped me physically, psychologically and spiritually through those difficult times with others affected by breast cancer. I’d already shortlisted CAMYOGA as a preferred training provider when I’d initially researched courses so, excited and inspired, I went straight to their website. I had no idea until that moment that they offered a “bursary scheme for those who can demonstrate their qualification will be used to teach in a community who will receive a high level of benefit as a direct result of the applicant’s work as a teacher”. So, full of hope and anxiety, I applied. This involved submitting an outline of my proposal and then an informal phone interview with CAMYOGA’s founder, Louise Palmer-Masterton. Fortunately, she believed both in the viability and value of my proposal (research has shown the benefit of practising yoga, mindfulness, and meditation for people affected by breast cancer) but also my commitment to, and passion for it. Louise also encouraged me not to let my disability hold me back. I was really worried about how I would cope with the ‘intensive’ part of the training but arrangements were made for me to rest as much as I needed to and the sense of achievement I felt on actually completing it was just wonderful. Once my training was booked, everything started to gather momentum. The local NHS hospital trust was extremely enthusiastic about my proposal and I’ve been working closely with the specialist Macmillan nurse there, Nicky Turner, who has been instrumental in getting the project off the ground – there was a lot of paperwork involved, as you can imagine! I might not be well enough to work, but can volunteer two hours of my time each week. For me, it is both my karma yoga and my dharma. And by volunteering I can ensure that the other part of my vision can be fulfilled i.e. that the sessions be free for participants. Having any form of cancer can be a massive financial burden and I wanted them to be as inclusive as possible. Having worked in education previously, and already being qualified to teach adults, I had both high standards and high expectations of the CAMYOGA course. I can honestly say they were exceeded in every way and that I would not hesitate to recommend CAMYOGA training to others. The course has not only consolidated and extended my existing learning but also given me the confidence and skill-set to be a knowledgeable, safe and compassionate teacher. I had a clear vision of what I wanted to achieve, and arrived at the intensive with my six-week plan roughed out (cancer-related themes using the chakras as a framework), but lacked confidence as to their viability and my ability to ‘teach’, to convey and share what I hoped to, so especially valuable to me was the way the training has engendered confidence within me to ‘teach from the heart’, be authentic, and to teach ‘my’ style of yoga. I (or rather my husband!) may have had the initial idea, but I am deeply grateful to the whole team of people, including CAMYOGA, who have made it come to fruition, plus a good dose of serendipity of course! The project received a massive boost when I approached the British Wheel of Yoga to see if they could support us in some small way and they responded by generously donating 15 sets of yoga kit (if anyone wants to follow our progress there will be updates on the BWY website, in the ‘news’ section). We are now half-way through the six-week pilot and initial, informal feedback has been encouraging and we even have a waiting list for the next one! Participants have agreed to complete an evaluation questionnaire after the final session, at which point we will undertake a formal review. Lincolnshire is a large rural county and we hope, in 2018, to extend the sessions to the other two main hospitals so they are accessible to people across the county. Nicky and I have been surprised and delighted by the amount of interest our small project has generated, not only in local media – we have also been approached by a team from a London hospital who are hoping to set up a similar scheme, which is wonderful. 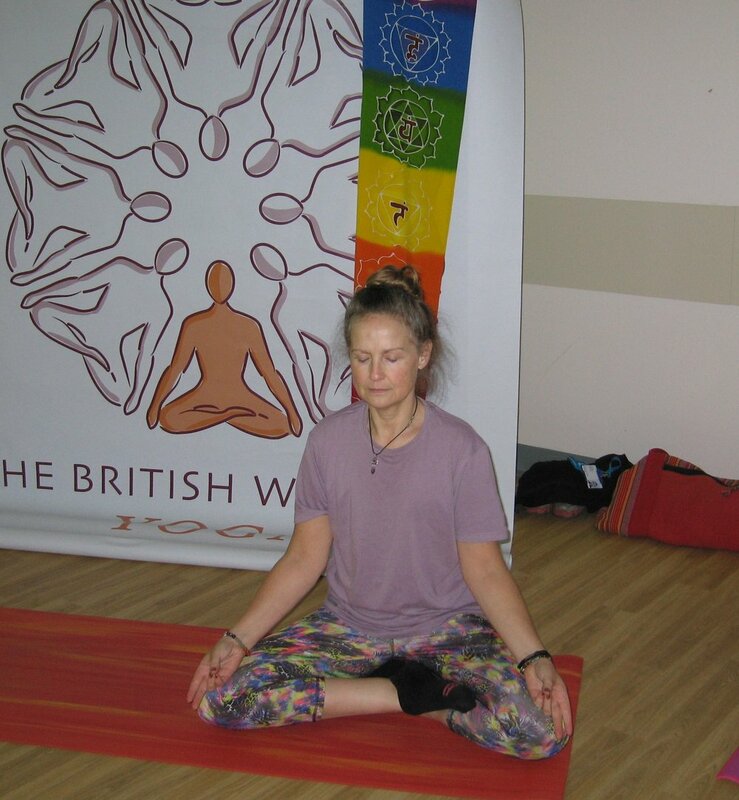 Louise Palmer-Masterton encouraged all of us on the intensive to have a BIG vision of what we wanted to achieve, and mine expanded to become, “free yoga to be available to everyone, through the NHS”. Watch this space!